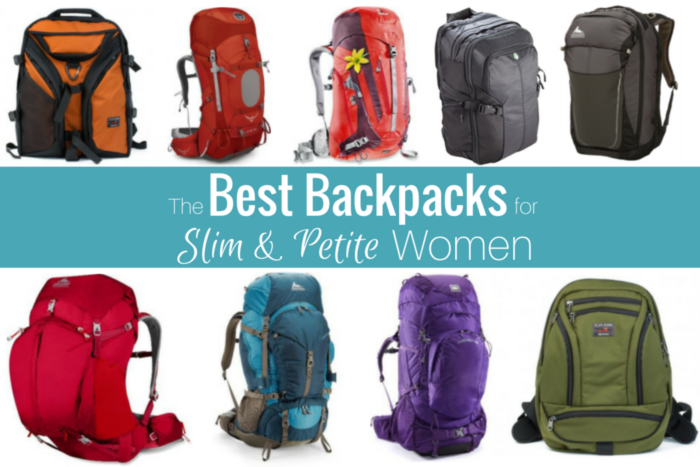 The following post on backpack choices for slim and petite women has been submitted by Tam Le. Everyone knows, choosing the right backpack is important. The right backpack can make the travel experience more pleasant, less frustrating and ensure you do not need to see a chiropractor when you return home. There is another great article on Her Packing List with a guide for picking a backpack. I highly recommend reading it to get the basics in what to look for in a bag. I am 155cm (5’1″) tall and weigh approximately 42kg (92 lbs). From my measurements below, you can see that I am tiny. When one is this small, there are some unique challenges in finding the right backpacks. Everyone looks for different things in a backpack depending on their needs. However, there are a few things that are crucial when you are this small. It is important to note that being short doesn’t necessarily mean that you will have issues finding a bag. It all depends on your torso length. There are plenty of shorter people who have “normal” range torso length and most backpacks fit them. Those with a regular torso length can often wear the travel style backpack. 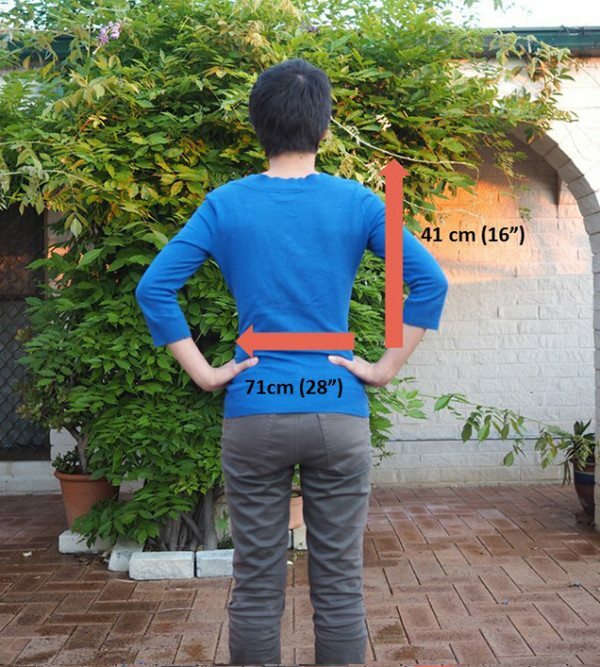 My torso is 42cm (16”), which puts me in the small size backpack range. I often look at the hiking backpack range because there is more flexibility. Look for backpacks that come with different size harness eg Gregory Deva range or adjustable harness eg Osprey Tempest range. As a side note: Adjustable harnesses tend to be slightly heavier as well. If weight is important then find the right size harness instead. 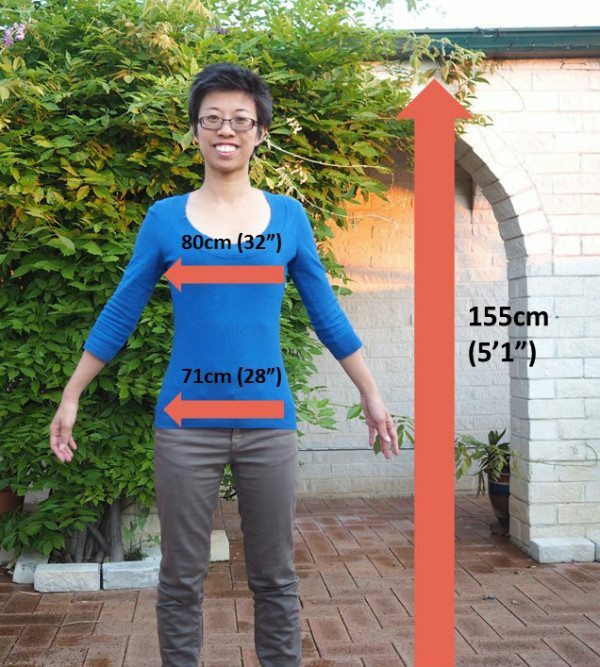 To find out how to measure your torso length, I recommend reading this page and video by REI. If you have a shorter torso length, this limits the type of bag you can get too. As said, most travel style backpacks are not adjustable. They tend to be a standard boxy size to help maximise the airline requirements and capacity. This leaves hiking bags, which are not as urban or travel friendly, but much more back friendly. If you only have a daypack or are not planning on carrying anything heavy, you may not need to worry about hipbelts on a backpack. Personally, I look for bags with hipbelts because it takes the weight off my shoulders. They say the rule of thumb is to carry no more than 25% of your body weight. Realistically you need to be fit and healthy to carry that type of load too, so the suggestions are around 20% or less. In my case, 25% of my body weight is only 10kg (22 lbs). To the average person, that doesn’t sound like much; most airlines allows that as carry-on luggage weight. I understand that being smaller means smaller clothes, but there are other aspects of gear that don’t really change. 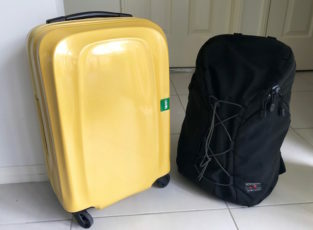 I normally aim for a 7kg (15 lbs) bag because I take cheap budget airlines and that tends to be a common carry-on restriction. For a lot of people I know, a 7kg bag weighs nothing to them. For me, after an hour of walking around getting to my hotel, its heavy. This means finding a bag where the hipbelt fits is necessary for me. Hipbelts should cover your hip bones (illiac crest) so the weight sits on your hips and takes most of the weight of the bag off your shoulders. Hipbelts can be padded, webbed, fixed or adjustable. A lot of bags have fixed hipbelts so it’s a matter of trying on different bags till you find one that fits. I’ve tried plenty of bags where I pull the straps and the hipbelt flops because it isn’t holding onto anything. Some backpacks have adjustable hipbelts and some can be custom heat moulded to suit your specific body. Many travel backpacks don’t have hipbelts but instead have waist straps. There is a difference between the two. The waist straps are often thin and not as comfortable and they don’t bear any weight of the bag but instead bring the load close to the body. As a petite and slim person, capacity feels like an easy decision. I can’t carry a lot therefore I don’t need a big bag. However, a lot of the great features of adjustable torsos and hipbelts, are only found in the larger capacity backpacks. This is one of the really frustrating things for me. In order to have the fully kit out adjustable everything with a padded hipbelt, the bag needs to be at least 55L. As you get into the 40L range then you might be able to find adjustable harness or different size bags but normally fixed hipbelt and some hipbelts are padded. In the 30L range then a mesh or breathable hipbelt with a fixed harness size becomes the norm. Under 30L and hipbelts don’t really exist, as seen in the Tortuga Air and the Tom Bihn Smart Alec. While there are a lot of 42kg ladies who can carry half their body weight and carry a 60L bag around the world, I am not one of them. I think petite ladies realistically should look for bags around 40L. Anything bigger means it gets too heavy. For the light packers like me, aim for a bag that is around 28-34L. It is important to think about what you want from the bag too. What sort of access (clam shell, U style, top loading)? Where the pockets are placed? Do you need it to be laptop friendly? Do you need women’s specific fit? All of these features impact how you use the bag. So, which do you prioritize since very few bags have everything a person wants? I personally look for women’s specific fit bags because they are a little narrower in width, with shoulder straps and hipbelts for me. A bag that isn’t too high since it means losing balance. I like a bag that has the ability to add a hydration bladder, have front opening access, and side pockets for a water bottle. As you can start to see, there isn’t a large range of bags for slim and petite women. Below I outline some of the bags I’ve seen online that fit the various criteria. While the majority of travel bags don’t work for small frame ladies, below are a few that may work for some depending on the length of their torso and priorities on features. Need a bag for multi-day hikes or long term travel? Check out these ones below. These are either junior or women’s specific fit bags. Want something more airplane friendly or easier to carry because it just isn’t so heavy? Take a look below. >> Check out all the best travel backpacks for women all in one place. Great piece! I just upgraded to the Gregory Deva 70 L pack and love it! I was previously using an Osprey 50L and needed something bigger for my RTW trip next year. If you don’t pack it full you can carry it on the plane fine. I used it on Wow Air to Iceland last month and had no problems with it. However, if it’s packed to the rim then it definitely is too big for carryon. I always recommend trying backpacks on in person and have a professional size you. I had my father measure me at home and he said I was a Medium. I had the guys at Eastern Mountain Sports measure me and I’m an XS. Great, informative post! I’m sure many will find this helpful. I’m 5’2″ with an unusually small and narrow upper body. After several years’ worth of trips with an uncomfortable (if otherwise beloved) Osprey Porter 46, I finally started looking for something better fitted to me. I had a few false starts, then was shocked to find myself with an advertised-as-unisex bag, the 40L REI Vagabond. It turns out that, despite my need for petite dresses and jackets to fit my upper body, my torso still isn’t short enough to be comfortable in a standard “women’s” backpack, as the hipbelt sits too high on the waist instead of low on the hips. I had no idea that the unisex Vagabond would be just the right torso length for me. I guess you never know what pack’s proportions will really work on your body! I agree, always try the backpack on with weights and walk around the store for at least half hour if possible. I know people who bring their packing cubes of clothes and stuff to make sure it can actually pack in well and then walk around the store making sure its comfortable because those weight bags always feel different to a bag packed with clothes. My sister and I are pretty similar in size and weight and yet we have such different type of bags because our body is still shaped so differently. To be honest I am still trying to find the perfect bag. Thanks for the review – it is such a challenge to find bags that don’t hand too low. I am also 5’1″ and under 100lbs. I have an older version of Deuter AC Trail 28 SL. I love it! First backpack I have owned where the weight is actually on my hips. The u shaped opening is a godsend for packing/unpacking. I use this bag for business travel, vacations and am considering it for a hiking trip. It fits under most airline seats. It even fits in overhead bin of Dash8. Sure beats having bruised shoulders from a bad that doesn’t fit right. My bag is similar but not quite the same as yours. What I don’t like about my Deuter bag is there is no compression straps so if it isn’t somewhat filled can be a little uncomfortable. However, its been the best I can find so far that fits my descriptions. They have released a new version of my bag and it has compression straps so it must of been a major complaint. I agree, kids anything is great. Most of my hiking shoes are kids size and a third of the price. If I can find the same item but in kids, that is what I do. I brought a merino wool macpac hoodie size 12 kids for $40 when the adult size s was just a little bit larger for $80. I know a lot of people buy kid’s bags but my personal issue with the kids packs are the ones I’ve seen so far are top loading or too big for what I am looking for. Which bag do you have? I’m 5’1” and about 100 lbs. I also have a bad back & neck. Traveling to Colombia for 8 days. What do you suggest? Thanks! I have trouble finding bags, I’m tall at 5’11 with a long torso but My measurements are very small. I only weigh 108. Try the Gregory range. They have XS – L in women’s specific bags that might work for you. Great post! Have anyone looked into the Osprey Ozone travel packs that come in 24L, 35L, and 46L? They seem to have great organizational features but not sure how to the torso fits since they don’t seem adjustable. These aren’t adjustable torso so it depends on your torso size. From what I can gather from the manual 24L is 17inch, 44cm; 35L is 19 inches and 49cm and 46L is 20 inches and 52cm. The 24L bag would probably work for me as I am 41cm but the other bags would be too long for me. I don’t suppose you’ve tried out the toddler carrying backpacks and have any suggestions? I’m 5 foot and want to be able to carry my toddler around the city so I can avoid trying to take a stroller up and down subway stairs. Have you looked at the Osprey Farpoint 40? Seems to have better hip straps than the Porter, or the competitors, but it might be too large for us 5’1″ girls. I just bought the Farpoint 40 and after lugging it around brazil for 2 weeks (Sao Paolo, Ilha Grande and Rio so a variety of different landscapes : large hilly city, remote island and flat large city!) I’m actually really disappointed. Hi Marie – sorry to hear that! But thank you for sharing! So many people rave about the Farpoint, so it’s good to know it might not be suitable for more petite women. I just purchased the Farpoint 40 online and am returning. . I want to find a 30 L back that’s front loading and has great support but so far I can’t seem to find any. Hi, TQ sooooo much for this post! Great post! its really help me out to choose the right size of backpack suits my size. Thanks! I’m 5 ft and 125 lbs and new to backpacking. I bought an Osprey 65. It took a long time to find one that fit my short torso. I’ll let you know how it works out! This was a great article! Thanks for the advice! I’m 4′ 10″ and just started venturing in to backpacking. I’ve found finding the right pack a very difficult case, but your guide will be extremely helpful for me. I’m 4’9” 115 lbs, somewhat (but not totally) new to backpacking. I just bought the Gregory Jade 38L. Have only taken it on a few test hikes, but so far it feels comfortable on my short torso. I am 17” assuming I was measured properly. Hip belt *might* be riding a little high, but I am still testing it out. I bought this model because I can’t stand having the pack frame in the way of my head/neck. With this one, I am able to bend my neck completely back to look at the sky. Much more comfortable and I am able to wear a wide-brim hat. Thank you so much for writing this!! You’re awesome! Just wanna echo on the sentiments of some of the ladies up here regarding the Osprey Farpoint 40. Everyone seemed to love this bag and I can’t blame them because it does have great features. I don’t think I have seen one review that said this bag didn’t work for them until I got here. I’m 5′ and 80lbs. When I tried on the Farpoint 40, even though it’s empty it was very easy to tell that it’s not the right bag for me. It’s too big! I look really overpowered by the bag. To my dismay, I had to look for other bags. I’d reallyyy love to have a lightweight, front-loading, with hipbelt backpack that fits me right but I haven’t found one yet. I’ve named my backpack “Huggles” for a reason. After trying what felt like thousands of bags that were too big, too heavy, too wide, too minimalist in padding or any sort of functionality. I finally came across one that fitted perfectly. It’s not the biggest of bags neither the cheapest but was a total winner for me. I’m just shy of five foot (1.51m) and now the proud owner of the Mira AG 34L XS. Bonus is it comes with a fantastic hydration system in its own compartment that I use as a laptop compartment when flying instead of hiking. In other words both hiking and carry-on friendly. 🙂 Got mine from Camp Savers. Tam: Great article!! Feel free to contact me to compare notes on other items I’ve come across/bought over many years travelling/hiking. Just want to give a quick update and recommend a backpack that I brought with me on a 12-day trip to four countries in SEA. I got an Osprey Tempest 20 which fit me well and carried a load of almost 7kg. It was the XS/S size and initially, I thought it was too small. I was so worried every time I zipped the bag close because it was so packed, it might rip! Fortunately, it didn’t! But during the trip I found out how doing the laundry in the shower was so doable (lol! but just 1 – 2 items at a time only) so I had 6 unused shirts. The issue was with how I packed and not really the size of the bag. Anyway, though the Tempest 20 is considered a daypack, you can still travel with it so long as you pack minimally. It’s very lightweight, durable, has a hipbelt, mesh back panel, lots of pockets and an adjustable torso. I love it!! I am 5’1″ and 118 lbs. What bags should I try? The reviews are for 2015 and 2016. I am not sure those bags are still around. Any suggestions? I’d also love to see an update to this list, as well as more lists for petites! Thanks so much for this! If done correctly, my torso is 16″. I am 5’0 and 200 lbs (working on losing weight). I am looking for a bag in the 20-30L range (I have a Sierra Access bag and most of the time feel it is too big for my needs). I’d like one that expands (only 1-2″) and that is a boxier shape. I’d like it to be my only bag (carry-on). Which size/bag would you all recommend? I like the ‘vbag’ on indiegogo but I don’t have much faith in them (crowdsource) for such things. Thanks so much. I can’t figure out how to edit it, but I forgot to mention, that I’d like it to be a clamshell opening as well. I’m 5′ with a short torso. My inner furnace cranks when I hike, and I REALLY want to take advantage of the newer trend toward ventilated packs. I tried the smallest of the Osprey and the Gregory J38, but the frame of the ventilator web hits the back of my head! I haven’t seen a kids pack with good ventilation. Any suggestions? Thanks. Try the women’s Osprey Tempest. I have the Tempest 40 and have used it for multi day backpacking trips. You can fine tune to get a great fit. They are available in different sizes. I am 5’1″ and 113lbs and carried 27lbs of gear,food,and water comfortably. The only thing I would change (which they may have on the newer version) is thicker shoulder straps. I’m 5’1 and 102 lbs. and must have a short torso because just went to a store and tried on all the possible backpacks that would work (those around 30-40 something litres) and only one worked for me. The Osprey Ace 38, a kid’ backpack. I have a sway back, and this was the only one that didn’t go down too far and make my back hurt. I haven’t used it yet, but I did walk around quite a while with weights in it. The straps let you compress it down pretty well, so I think I can underpack it and still have it be quite compact. The next size up in the same model has wider positioned straps and didn’t work for me at all. I had no idea finding a backpack would be such a challenge! But now I’m just thankful I found one I really like. Thanks for this article; it gave me an idea of what to start out looking. I’m 5′ tall, 108 lbs and for backpacking I use the Osprey Ariel AG 65 size XS and managed to get the adjustable harness fitted just right! However, I found that because of my short height I had to pack the bag differently than the traditional way (sleeping bag on the bottom, heavy stuff in the middle, light stuff on top)…instead, I have to put ALL the heavy stuff on the bottom (food, water bladder as far down as it will go, tent, toiletries, etc), then my sleeping mat, sleeping bag, and clothes stuffed in all the empty spaces, then the lightest items on top. I don’t put ANYTHING in the outer back pocket, and only a few small things go in the very top pocket (sunglasses, couple of granola bars, map, maybe a light pair of gloves). I could almost actually just take the whole top lid off…I’ve got things packed that far down! It’s the only way to get a 25-30lb load to sit on my hips and not my shoulders. I took me a few trips to figure this out, and let me tell you…it made a world of difference! So, if you ever feel like your load is going to pull you backwards or all the weight is in your shoulders you might try changing how you pack it. I almost sold this bag before I got that figured out and now it’s WAY more comfortable and actually fits really well! I highly recommend the Ariel AG for backpacking! Thanks for the tips, Shelaine! Just goes to show that there is not a one-size-fits all bag or way to pack 🙂 Glad you found something that works for you!